I was in Waterstones yesterday, browsing the books and looking for inspiration for Grace’s birthday. It’s not often I actually wander around a bookshop – Amazon’s put paid to that – but when I do, I really enjoy it. Ever since I was young I’ve loved the smell of books – new and old – and when you’ve got thousands of them in one place it’s even better. Anyway, I wended my way over to the children’s books to see if I could find something for Jim. Jim’s 22 months now, and he loves books (more than once I’ve had to go upstairs and wrestle one off him when he’s supposed to be sleeping) and I thought getting a new one would be a sensible decision – there’s only so many times you can read Hairy Maclary from Donaldson’s Dairy. 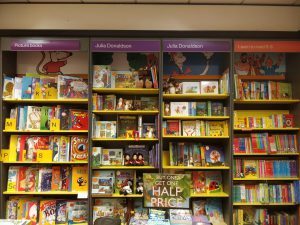 As you can just about see from the dodgy picture, the books are segmented into various categories, but there’s one particular category that’s a little different to all the others – the Julia Donaldson category. If you’ve got kids, you’ll know that Donaldson is responsible for the legendary Gruffalo book, and – to be fair – her stories are outstanding. In fact, they’re outstanding enough that she’s got her own section in Waterstones – the only author in the whole shop to have that privilege. There’s a big lesson here – when you’re operating in your own category, and you’re not competing with anyone else, it’s MUCH easier to make sales. Joe Calloway writes about this in Becoming a Category of One, and the point he makes is very wise. The book explains that the less your prospects are able to compare your product to others out there, the less commoditised your product will be, the more elastic your pricing is and the easier it is to attract the right customers. So many businesses do the opposite – they look at what their competitors are doing and try and copy it – but doing so only invites an ‘apples to apples’ comparison. That’s exactly what Julia Donaldson has avoided, and that’s why she’s on the Sunday Times Rich List and sells £10 million worth of books every year – what can you do to create your own category?